Phyllis Pray Bober (obit 2002) wrote one of the most idiosnycratic and exciting food history books of recent years with her Art, Culture and Cuisine (Chicago 1999), which touches extensively on Italian cuisine, ancient and medieval. PPB attempted the impossible in her pages – the integration of artistic styles with cooking movements. Truly ambitious stuff! The book has not had the success it richly deserved: we hope that this plug will sell a couple more copies. This extract – concerning the origin of pasta – gives a flavour of her work. PPB favoured the Greek invention of pasta: but this depends on the priority of the Greek pasta words over the Arabic pasta words, something that has still not been fully established. We give here the text without footnotes so as not to anger the gods of copyright. ‘The point has come to consider the vexed question of ancient pasta. Today at least there is enough responsible writing on food history to have laid to rest a persistent fable that Marco Polo brought noodles back from China, although his only surprise at ‘pasta’ (not at a loss for the word) he met on his trip was encountering noodles made not of flour but of breadfruit growing on trees. There are two schools of scholarly thought concerning the beginnings of simple (i.e., flat varieties, not extruded hollow types) pasta-making. One follows an Arabist, Andrew Watson, who argues that it was the Arabs who invented pasta, introducing what has become the national dish to Sicily and South Italy in their conquests of the ninth century A.D. The Arabs certainly did bring reformed methods of farming to North Africa and Europe, as well as many new products, including sugar cane, eggplants, spinach, and a broad range of citrus fruits to supplement the citrons known in antiquity from Persia. But many scholars, myself among them, argue that noodles and lasagne, whoever invented their first (inevitable?) preparation of flour and water, sometimes with added egg or other ingredients, were already well known to Greeks and Romans. Our case has been enormously advanced by modern paleobotanical research which proves that durum wheat, the gluten-rich, ‘heavy’ wheat required for good pasta, was grown from an early date and is one of the reasons that much Greek and Roman bread was very dense. It was durum wheat that made Greek semidalis – semolina. For Watson, durum wheat was not an important crop before the medieval period. Even so, the only widely read author on cookery outside the academic community who seems to have the right explanation is Patience Gray; in Honey from a Weed she announced the discovery of those who live in Apulia and other Italian provinces once the heartland of Magna Grecia (one I made for myself in May 1995) of the etymological proof needed to supplement botanical evidence. This involves two ancient Greek words: laganon, plural lagana; and itrion, itria. When one learns that the Arabic word itrijah, found in Aramic and Hebrew cognates, means ‘noodle’, it is difficult not to see a derivation from Greek, originally connoting ‘ribbon’. In the Salentine peninsula and the region around Taranto, the dialect preserves lagana for the rolled out square of dough used by housewives to be cut into pasta, and tria (itria) survives in the local dish, tagliatelle, cooked just as in ancient Greece with chickpeas and wild arugula (rocket). Part of the pasta is preserved in browned in oil in final assembly of the speciality as in a recipe preserved in Athenaeus (XVI, 647e) that incorporates lettuce juice to make green pasta. The ‘waters’ of the pasta invention controversy were somewhat muddied by one Italian archaeologist who supplemented linguistic evidence with that of an artefact represented in an Etruscan tomb. The rock-cut supports of the Tomba dei rilievei at Cervetri are decorated with with reliefs of objects of all kinds, some for warfare, others of household equipment. One seemed to be an ancient spianatoia, a board for rolling out pasta, complete with a little bag of extra flour hanging from one handle. Alas, definitive study of the reliefs has now identified the object as a gaming board precisely like one shown on an Etruscan mirror being used by two competing Greek heroes. This does not negate Etruscan knowledge of pasta, however, and at least one museum devoted to history of the genre holds that they even rolled flat noodles about metal needles to fashion macaroni (much as medieval and Renaissance cooks would anticipate extruded manufacture of spaghetti at a later date). In a recent gastronomic insert of the Corriere dell’Umbria (16 Nov 2010, p.15), there is an article called “Regina d’autunno dal bosco alla tavola” (Queen of Autumn from the Woods to the Table), which discusses ways to cook chestnuts. 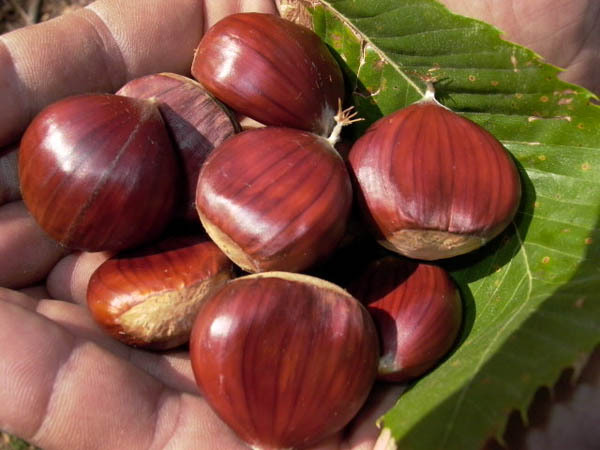 The author, Agnese Priorelli, underlines that chestnuts have been used for food since time immemorial, and mentions their use in many traditional dishes. After these “historical” comments, Priorelli gives two recipes, one from the Gambero Rosso, a Slow Food publication: Duck Paté with Chestnuts. The recipe calls for duck breast, chestnuts, chicken livers, laurel leaves, onion, garlic, butter, pancetta (like bacon), white wine, olive oil, salt, and pepper. Though nowhere in the text is this recipe called “traditional,” the tone of the article (and, in fact, of the whole gastronomy insert) and the fact that the recipe is from a Slow Food cookbook, implies that this is a recipe that could have been eaten centuries ago. Grazie a Daniela Buglione per la segnalazione. From the original article. The question posed here is "Would you eat this hen's eggs? Chicken A: Raised with four other hens in a cage that measures 60cm by 47cm, meaning there is 540 square centimeters per bird. Both water and food are available at all times. Chicken B: Raised with forty-nine other hens in a cage that is 300cm wide by 200cm tall by 480cm deep, giving a space 2,570 square centimeters per bird. Water and food are available at all times, as are nests and sand for sand baths (to rid the birds of parasites). Chicken C: Raised with 11,999 other chickens in a single cage that is seven hundred square meters. Every day from 11 in the morning until dusk the chickens are given access to a four hectare open air where they can eat, drink, and take sand baths. Grazie ad Anna Selberg per la segnalazione. 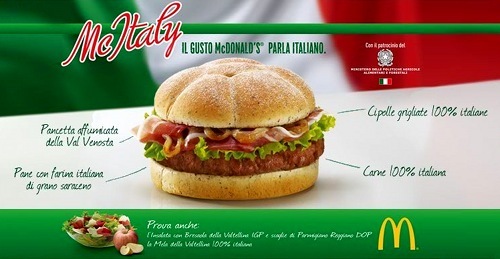 In January of 2010, McDonald’s Italy launched its McItaly burger, billed as “A meeting of tastes: the unmistakable taste of McDonald’s® meets the tradition of typical Italian ingredients.” The launch of the burger took place at the McDonald’s restaurant at the Spanish Steps, where in 1986 the protest (against the opening of that same restaurant) that launched Slow Food had taken place. Present at the launch was Luca Zaia, the then Italian Minister of Agriculture. Zaia praised the McItaly, made exclusively of Italian products, and even gave the burger the ministry’s official patronage. Minister Zaia at the unveiling of the McItaly. something anything but Italian: “Whose grandmother ever made something that looked like this?” he asked rhetorically on the RAI weekend show Che Tempo Che Fa. The Ministry of Agriculture issued press releases denouncing the gastronomic snobs and underlining the Italian-ness of the burger and its aid to farmers in Italy. The polemic continued for two months, until the (already planned) end of the McItaly promotion dampened further polemics. View the original press releases of McDonald’s and the Ministry of Agriculture, Petrini’s letter in La Repubblica, and Zaia’s response. The Food Bibliography is searchable by title, author, and key words. Students should note though that summaries or abstracts are not provided, and the sources lean more towards the academic than the popular.